Polluted runoff is on lots of northwesterners’ minds these days. Smart thinking and capital are flowing into the problem, and our traditional gray infrastructure is wisely going green. But what if, like environmental naturopaths, we also treated the root of the issue rather than simply lessening the unwanted effects? What if we reduced volumes before the rainwater became polluted runoff? That is the advice the Urban Greenprint project is following, straight from Nature. We are all too familiar with the problem: accumulating and persistent toxins are overwhelming our water bodies. We know that the majority of these pollutants run off our roads and parking lots, and periodic overflows of our storm-sewer systems add to the noxious chemical soup. 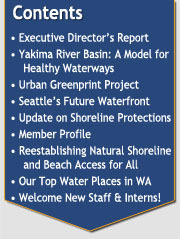 With the EPA’s mandate to clean up Puget Sound’s storm-sewer overflows and Seattle’s renewed commitment to manage stormwater with green infrastructure, we are on it. We are tackling the problem sensibly: by building green stormwater infrastructure - natural filtration systems that cost less up front, cost less to maintain, and provide additional benefits like increased property values and healthy habitat. Nature’s filtration - green stormwater infrastructure (GSI) - is the right answer. It’s critically important and no doubt the right direction to be taking. Nevertheless, we need to bring a variety of smart approaches to the table if we want to solve the critical issue of polluted runoff. GSI is not the only strategy we can adapt from Nature; Nature has many more lessons to teach us. Looking to the wisdom of Nature, the Urban Greenprint works through the lens of biomimicry. Biomimicry is a rapidly expanding field that, at its most essential, is about function. How do organisms do what they do, and how can we apply that same functional approach to solve our own challenges more sustainably? Core to biomimicry is the fact that, for billions of years, Nature has been solving many of the same problems we’re currently faced with. Almost any physical function you can imagine – from the general to the specific - has been carried out by an organism, and evolution guarantees that those functions have been honed to a successful balance point. Whether it's learning from a hermit crab about how to be resource efficient, looking to a whale’s fin to reduce drag on a wind turbine, or studying a camel's nostril to better understand condensation and water efficiency, we can find relevant, fascinating examples in nature for all of our design challenges. Why do we care how Nature solves these puzzles? Unlike us, Nature solves problems completely sustainably. Imagine how different our world would be if all of our waste were another organism’s food source, all of our material goods were sourced locally, and all of our energy needs were met by the sun. This is not a new idea. Scientists and designers have been looking to nature for solutions for millennia. Nevertheless, the industrial revolution and its aftermath have generated societal amnesia about Nature’s benefits, much less the fact that we are ourselves part of nature. Biomimicry gives us a language to translate Nature’s success stories into models we can emulate. At a deeper level, Biomimicry is also about understanding that Nature can be a powerful mentor. Many of us feel the ache of perceived disconnect from nature and the gut knowing that we are not living in balance on the planet. The imagined gap between us and Nature has grown wide in the last couple of hundred years, and many people see Nature as simply a resource. Even those of us who cherish Nature view it as a resource – as a place to hike or breathe fresh air. Biomimicry asks us, in the words of Janine Benyus, to “quiet our cleverness” and recover the sense of wonder we felt as kids sitting amongst the ants. As adults, we can energize that wonder with a strong dose of science, gleaning practical lessons from what we see and imagining how we might imitate what we’re observing. The Urban Greenprint finds solutions to environmental issues through a two-pronged approach: by gaining a deep understanding of a city’s predevelopment and current natural ecosystems, and by applying biomimicry to identify strategies that improve ecosystem function. What would Nature do? That’s the question the Urban Greenprint hinges on. This approach affirms that Nature has a lot to teach us if we attune our senses. With a focus on biodiversity, CO2, and water cycles, the Urban Greenprint team is looking at how the Seattle area functioned ecologically before urban development changed its balance. How did the local wetlands and forest function? How did these ecosystems cycle carbon, support biodiversity, and manage water flows? The research also evaluates current conditions to understand how these cycles function now, and therefore what our most pressing current environmental issues are. The project has highlighted many interesting lessons, and one of the most interesting is related to our regional stormwater cycles. When the rain fell on our old growth forests, prior to urban development, about half of that rainfall sank into the ground. This is not surprising. We would expect a significant amount of infiltration in a natural setting. What is surprising, however, is the fact that with the exception of a tiny amount of water that ran off during a heavy storm event, the remainder of the rainfall returned to the atmosphere. 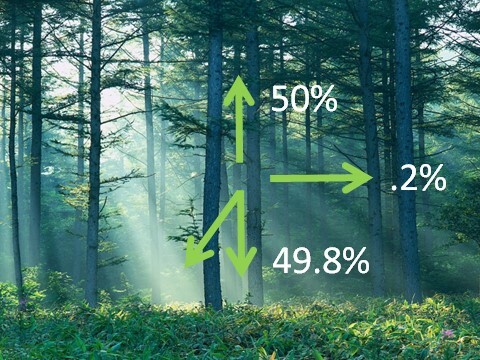 In other words, when it rained, 50% of the rainfall either evaporated from the forest surfaces or was taken up by the plants, used, and then transpired back into the atmosphere. 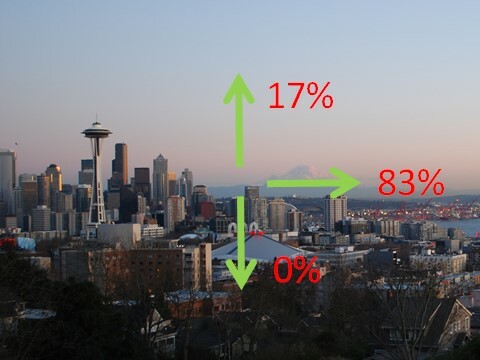 In contrast, in the built or paved areas of our city, which includes the majority of downtown Seattle, evaporation is now closer to 17%, and runoff makes up the balance, approximately 83%. What this tells us is that if we can increase evaporation to be closer to that of predevelopment in our dense neighborhoods, great leaps will be made towards solving our polluted runoff problem. Recognizing this enormous functional gap between predevelopment and current rainwater flows, the Urban Greenprint team asked the question, “How does Nature evaporate?” A series of workshops were held where the team asked attendees this and several other “How does Nature…” questions. Participants identified organisms with high evaporation characteristics, researched specifically how those organisms carried out evaporation, and then brainstormed how each particular strategy might be replicated in local buildings or infrastructure. APPLICATION TO BUILDINGS: Roofs and other building materials can be designed with multiple layers of surfaces, or perforated canopies can be designed to break large drops into smaller drops. FUTURE VISION: Can we design canopy-like sculptures that connect buildings and shelter sidewalks from rain, allow light to pass through, and break raindrops in the same manner as a forest canopy? Rough forest textures – moisture settles into the rough surfaces of tree needles, cones, and bark, providing time for rainwater to evaporate before it hits the ground. APPLICATION TO BUILDINGS: Roofing and cladding materials can be specified with textured surfaces that provide small areas for water to collect and evaporate over time. FUTURE VISION: Could the City incorporate design standards for all public amenities like bus stop structures and covered walkways to include these bumpy, and potentially absorptive, surfaces? Spongy forest materials – much of the rain that makes its way to the forest floor is held by downed wood, mosses and lichens, slowing water down and providing additional time for it to evaporate. APPLICATION TO BUILT ENVIRONMENT: Rain screen cladding and landscape materials that absorb rainwater can be used to provide more time for evaporation. FUTURE VISION: Could curbs and paving materials be designed to hold water and slowly release it over time, not just beneath the surface like pervious pavers, but from the material itself? Plant transpiration – plants uptake water from the soil and then exhale moisture back into the atmosphere. APPLICATION TO BUILT ENVIRONMENT: Water features using captured rainwater can be designed to splash and move water to enhance evaporation. FUTURE VISION: Can we design building façades that absorb water and emit it slowly to the atmosphere over time? 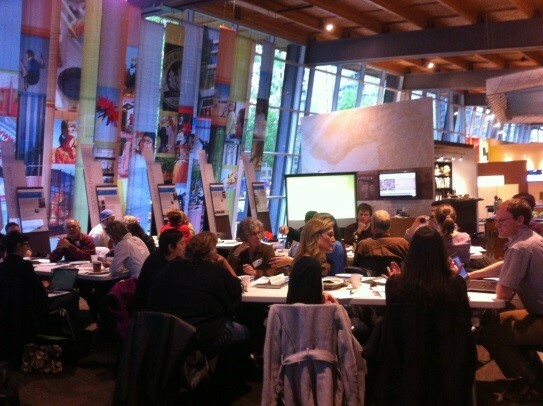 With support from the Bullitt Foundation, seeds are being planted to implement these and other Urban Greenprint lessons. 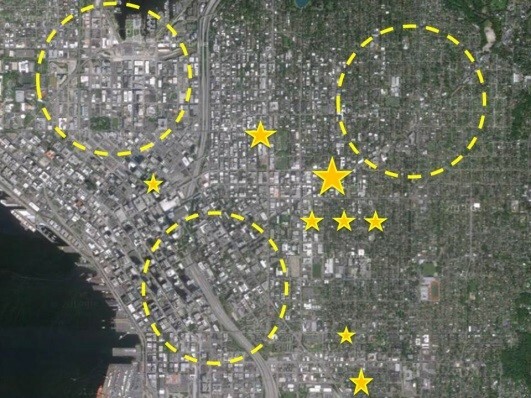 The second and current phase of the project is underway: engaging key stakeholders and gathering information about ecosystem improvement projects that have already been made, and then overlaying those improvements onto a map of Seattle. Emphasizing that the city is an interconnected ecosystem, rather than an assemblage of properties and projects, will underscore the importance of approaching resilience and sustainability on a city scale, even when designing a single building or site. As more projects populate the map, two types of gaps will be revealed: 1) physical gaps - areas of the city with few ecosystem sustainability projects; and 2) functional gaps - some buildings will do an amazing job mitigating stormwater or supporting biodiversity, for example, and others won’t. Coupled with the understanding of how nature functions optimally in this region, these gaps will help identify what work needs to be done and where leverage points are. This is where you come in: The next time you take a walk outside, notice the elements of nature all around you. Think about their function and how they contribute to a healthy, enjoyable, sustainable environment. Then think about the existing buildings and sites in our city that could benefit from these lessons and the application of the Urban Greenprint methodology. We would love to hear your ideas. Nature has already figured out how to live sustainably on this planet and has been doing so for billions of years. We haven’t. Isn't the natural environment our most obvious mentor? What is the Urban Greenprint? The Urban Greenprint is a methodology that applies biomimicry at a city scale, illustrating what Nature can teach us in order to transform Seattle into a more resilient, healthy, and livable city. When we take the time to reflect on the vast and elegant function of Nature, we understand that we could learn a lot if we just slow down and listen…really listen as if Nature were our mentor and we were students, eager to learn. The Urban Greenprint provides the tools for designing a building or site to incorporate sustainability innovations inspired by nature - including tools that can help us manage stormwater. 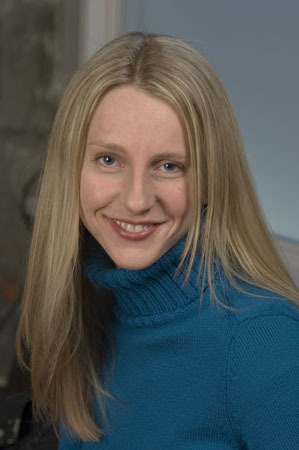 Jennifer is a deep green architect and sustainability consultant with over 20 years of project experience. She splits her professional life between her own design and consulting company, 55-5 Consulting, and her work on the Urban Greenprint, a project run through Biomimicry Puget Sound. Jennifer works with a vision that successful projects must be inspired by an insightful understanding of place and must renew the human and ecological communities they touch. She is committed to helping regenerative design become the norm and creating opportunities for meaningful connection with our environment. Jennifer is very active in the Northwest green building community. She stays engaged with local and regional environmental advocacy efforts, and she is frequently invited to present at conferences and workshops. Jennifer speaks on various sustainability topics including LEED, biomimicry, and sustainable water treatment. 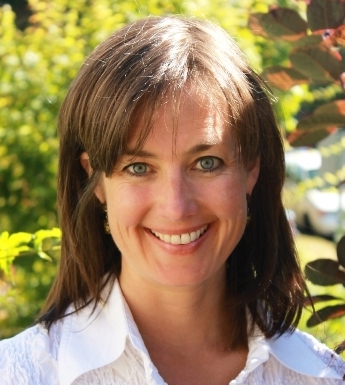 She is also a founding member of Biomimicry Puget Sound, a regional offshoot of the Biomimicry Institute. Jennifer has a BA in Architecture from Princeton University and a Masters of Architecture from the University of Washington. Alexandra Ramsden leads Rushing’s sustainability consulting and training practice and is a cofounder of Biomimicry Puget Sound. At Rushing, she guides teams to identify project appropriate sustainability solutions for buildings and businesses and develops and teaches green building educational programs. Drawing from her 14 years of experience and her multidisciplinary background of both science and architecture, Alexandra approaches projects holistically and harnesses the expertise of all the team members at the table. With a variety of over 100 green building projects under her belt, from multifamily residential to libraries to transit facilities, she has the tools to guide organizations to a customized solution. Alexandra’s passion for nature’s power as a design mentor led her to found Biomimicry Puget Sound, a local network of biomimicry enthusiasts gathering to foster change in policy, design, and lifestyle through the perspective of nature. Alexandra has worked with a number of organizations to create and deliver customized sustainability education programs. She is an instructor in the Sustainable Building Advisor (SBA) Program where she teaches sessions about green materials. In addition, she has developed reports and guidelines for green operations and maintenance for existing buildings. Alexandra lectures internationally on Integrated Design, Biomimicry, Net-Zero Design, Living Building Challenge, and LEED. The City of Seattle and King County have charted RainWise as the approach to reducing combined sewer overflows into Lake Washington, Lake Union and Puget Sound. There are about 40,000 property owners and 17 neighborhoods eligible in a rebate program that has goals almost identical to those in Urban Green Print. I see synergy in combining efforts. Great ideas that have to be implemented in the forseeable future. I like the idea of echo tourism. There are only benefits from it for both nature and people. By the way, check other articles about this topic at http://resumesexpert.com. "Happy City" author Charles Montgomery urban lab experience. More details coming soon! "NY City's new Mayor is promising to build or preserve 200,000 affordable units over 10 years. @SeattleChamber @Mayor_Ed_Murray"
"Where are the places Millenials want to live: "it’s cities like Boston, New York, San Francisco, and Chicago, as well as communities such as Boulder and Austin. 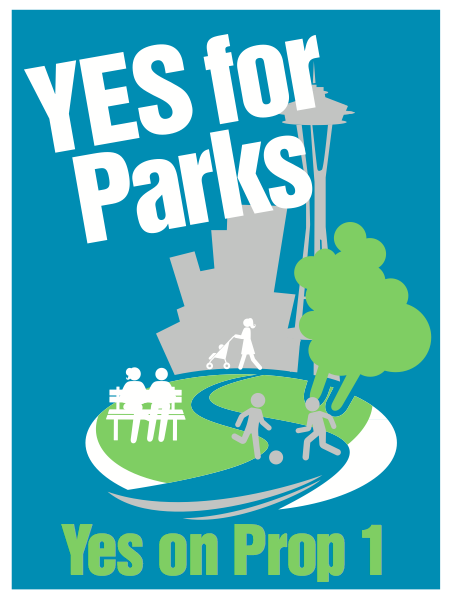 The key characteristics seem to be walkability, good schools and parks, and the availability of multiple transportation options."